Welcome to Issue 4 of SHAPE Journal. 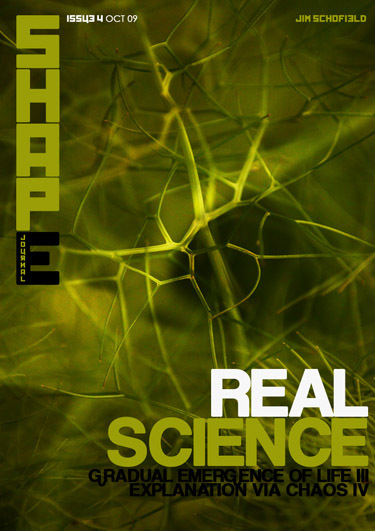 This issue includes the first instalment of a four-part paper on what I have called Real Science. This is a crucial paper, because it both criticises the usual pluralist methodology in Science, and also begins to outline a holist alternative. To give an idea of what is included in the whole series, I can only quote from the Abstract which puts it as clearly as possible below. This series of papers is concerned with the major flaws in the current scientific approach in isolating, extracting and abstracting formulae, and the description, and further formulation, of an already existing, and considerably more important, explanatory aspect of Science into THE major and necessary alternative. It contrasts the established and universally applauded pluralist approach, with a so-far, undeveloped holistic alternative. The main criticism of the standard scientific method lies in its assumption that Reality can always be analysed into a hierarchy of Wholes and their constituent Parts, and by this means explain the causes and motive forces that produce Reality as is. To reveal its limitations it likens the usual approach involved to that in a horticultural farm, and compares that with the state in a wholly unfettered area of virgin rain forest, and how it performs. It attempts to show, thereby, how the criticised approach studies a significantly and rigidly controlled set of Domains, and not Reality as is. How this enables Mankind to actually produce for need is addressed, as is the impossibility of dealing with real, qualitative development, and hence the actual Evolution of Reality. After the extensive criticisms, the question is posed as to how these can be corrected using what seems to be an impossible alternative – a completely holistic approach, where everything affects everything else. This leads to the definition of General Development with two different and contrasting phases. One involves slow changes within Stability, while the other, achieves its changes via quick, cataclysmic and indeed revolutionary overturns, in what are called Emergences. The full set of questions posed in these papers, it must be said, are by no means yet fully answered. Even when this series is complete, there will still be much to do, and perhaps the most important contribution will be a later series which defines a new version of Miller’s famous Experiment, which, though it established the natural production of amino acids by normal reactions in the Earth’s primaeval atmosphere, was not, at that time, able to reveal all the processes which brought this about. The new version will do just that and I am sure it will be a significant contribution to Real Science.